Children’s voices have hardly been heard in history and historiography. Recently historians have begun to reread sources in order to rewrite the history of children and childhood. In line with this work this paper seeks to demonstrate how children can be embraced as agents in history. Children suspected of witchcraft were required to present their worlds and perceptions thereof to an audience which was at times interested, but increasingly reluctant and which included hostile neighbours, family members, friends and, last but not least: official interrogators. The children’s stories changed depending on who was listening. However, the persistent narratives behind them alluded to the children’s social and magical environments. This paper will expose some of those narratives and relate them to the children’s realities across imagination and ‘reality’. In so doing I hope to contribute to the history of childhood as much as to the history of the ‘witch-craze’. When Elizabeth Lucar died on October 29 1537 her husband commissioned a ‘very fair Stone’ in her memory and had it placed in the ‘South Ile and Body’ of Saint Laurence Poultney in 'Candelwyk Street' in the City of London. Elizabeth was the daughter, niece and wife of prominent Merchant Taylors who built fortunes trading in the Mediterranean and with Spain’s Atlantic settlements. The epitaph on this ‘fair stone’ was unusual for the period because, although it placed Elizabeth in relation to her father and husband, it did not expand upon her lineage, praise her as a good wife in conventional terms, nor mention the four children she bore in less than five years of marriage. Her husband, Emanuel Lucar, chose to showcase his family’s status and values through his wife’s needlework, musical, mathematical, linguistic and calligraphic skills, and her ability, on ‘reading the Scriptures, to judge light from darke’. He remembered her as a multilingual, numerate woman - ‘a very perfect creature’. In my paper I place Elizabeth’s epitaph in context; exploring the complex world of faith, creativity, translation and knowledge exchange in an international trading network during a period of religious change. With Pen, Frame, or Stoole, all Pictures artificiall. Beasts, Birds or Flowers, even as things natural. This paper will place Lucar’s work in the context of the history of early-modern embroidery, and in particular in terms of the pattern or model books, which proliferated from the sixteenth century onwards. These books were aimed primarily at an audience of leisured women, providing patterns, though not instructions, for popular types of embroidery and lace. The books frequently also included verses extolling the benefits of needlework in inculcating virtue. The paper will examine the role of women as designers and embroiderers and consider the place of creativity in their work, as well as the way that needlework was used in the construction of morality and of gender. This paper was written as a contribution to a recent symposium on "Bankers as Collectors" held at the Frick Museum and sponsored by its Center for the History of Collecting, invoking Henry James' phrase, "there was money in the air...for the most exquisite things." Of course the princes of Europe had always spent lavishly on exquisite things to enhance their environments and reputations. But it was in the republic of Florence in the fifteenth century that a critical mass of elite merchants and bankers first overcame medieval moral scruples about usury, the essential precondition of the accumulation of wealth in business, giving rise to a whole class of patrons and collectors competing with one another to acquire exquisite things. My paper concerns the collections of Cosimo de' Medici (1389-1464) and his sons Piero and Giovanni, who died respectively in 1469 and 1463. Medici collecting was inextricably entwined with their artistic, political and personal patronage and their activities as bankers. Many of their acquisitions were made with the assistance of employees of the Medici bank, which in the mid-fifteenth century had branches or affiliates in 19 cities, including all the major Italian centres and extending as far as London, Bruges, Lyons, Barcelona and Rhodes. As the century progressed, and Rome and Naples became recognized marketplaces for collectors, the Medici relied increasingly on professional dealers. Emblematically, 1602 is the year that marks the birth of baroque music. It is the year of Giulio Caccini’s Le nuove musiche, the first collection of declamatory monodies emulating the singing of Classical tragedy, and the forerunner of opera. Rather than perpetuating the myth of this as a magical new invention, my study aims to connect Caccini’s music to the little-explored oral tradition of singing to the lute that persisted throughout the sixteenth century. 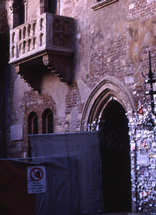 The meeting place between the old and the new is a Venetian lutenist-singer named Heteroclito Giancarli, author of a printed collection of songs with lute accompaniment published the same year as Caccini’s monodies. Despite his colourful name, Giancarli’s music has never been studied or performed since the early seventeenth century. This paper presents a first glance at the songs and their context. As religious and civil conflict increased in France in the latter half of the sixteenth century, reports of unsettling and dramatic events from nearby German lands in the uneasy wake of the 1555 Peace of Augsburg were of increasing interest to French readers. Stories of disaster, conflict and wondrous events took on particular resonance in this religious climate and appeared as the genre of the wonder book was also gaining popularity; such compendia – often illustrated – collected and presented strange events to an eager, anxious public variously interested in signs of the Last Days, in the latest news and in entertainment. This paper will examine the case of 1556 comet – sometimes known as the Charles V comet – through a variety of sources and in particular utilising two publications that appeared in sixteenth-century Paris and which pay close attention to German events close to the start of the French Wars of Religion in 1562: Gabriel Simeoni’s 'Les Prodiges merueilleux aduenuz & veuz en Allemaigne' of 1556 and Jean de Marconville’s 'Recueil memorable d’aucuns cas merveilleux advenuz de noz ans et d’aucunes choses estranges et monstrueuses advenues es siecles passez' of 1564. These sources have much to tell us about the way that dramatic events formed part of a print culture that circulated across linguistic and confessional borders and also how one society adapted and represented the print culture of another during a period of conflict and disorder. It is generally assumed that the ‘recuperation’ of the text of Vitruvius’s De architectura in the early fifteenth century was the watershed moment for the development of a specifically Renaissance response to technological innovations and architectural practices. But as important as Vitruvius proved to be in the period, his text had never entirely disappeared from view, and the problems it posed for Renaissance editors, translators, and interpreters were enormous. This talk will examine the complex interface of technological praxis and its representation both in texts – many of them literary in character – and images provoked by the renewed interest in Vitruvius. The resulting synergies had a significant impact on the development of a wide range of Renaissance technologies, buildings, and cities, demonstrating the interconnectedness in the period of disciplines such as philology, geometry and mathematics, natural philosophy, and the plastic arts. Michael Wyatt works on the cultural histories of Italy, England, and France in the early modern period. He is the author of The Italian Encounter with Tudor England: A Cultural Politics of Translation (Cambridge University Press, 2005), a former fellow of Villa I Tatti, the Harvard University Center for Italian Renaissance Studies in Florence, and co-editor with Deanna Shemek (UC Santa Cruz) of The Politics of Writing Relations, American Scholars in Italian Archives (Florence: Olschki, 2008). He is currently editing the Cambridge Companion Guide to the Italian Renaissance, co-editing ‘Devils Incarnate or Saints Angelifide’? Anglo-Italian Transactions in the Sixteenth and Seventeenth Centuries, and working on a second monograph, John Florio and the Circulation of Stranger Cultures in Stuart England. Few ideas in biology are regarded as more representing the state of the world than "species", and yet the original motivations for developing the notion in the 17th century were religious, in the work of Athanasius Kircher (c1602–1680), the Jesuit polymath. Prior to him, the use of the word "species" was interchangeable with "genus" in natural history. In order to accommodate all the "kinds" (species) of quadrupeds and birds on the Ark, in his tractate De Arca Noë, Kircher used several strategies, including eliminating those species that spontaneously generated (worms, insects and spiders), and those which were formed from hybridisation (such as giraffes, hyenas and several fabulous creatures). Kircher stands at the cusp of modern natural history evolving out of the bestiary tradition, and De Arca Noë was a serious attempt at natural history within the confines of his set problem, with many woodcuts of the organisms concerned. His work informed Bishop John Wilkins, the English polymath, as he constructed a classification of all possible concepts, and to this end he employed John Ray to draw up the lists of species in his Essay toward a real character and a philosophical language as part of the Universal Language Project. Ray was chided by his colleagues, and so he commenced an empirical list of species, in the course of which he presented the first truly biological conception of the term. I will then cover the subsequent history of the idea through to the Enlightenment, including the question of whether or not species were real or mere constructs of human thought. Early modern universities have produced a substantial amount of writings that for a long time has been largely ignored by intellectual historians. Disputations were and often still are regarded as a leftover from medieval teaching practices that were gradually supplanted by modern academic writing. This assessment is somewhat at odds with the fact that at least until the early 18th century disputations formed a central part of university culture. In this talk, I will explore the role of writings produced primarily for university purposes: disputations and academic orations. These texts have to be understood in the context of performances that were central to the way knowledge was assessed and produced at early modern universities. As such, studying these writings offers not only a direct insight into what was considered to be proper knowledge (and for which reason), it also sheds light on the structure of the ‘representative publicity’ of universities. Focussing on Dutch universities, I will argue that far from being a relic of a previous age, these writings fulfilled functions that became central to the early modern research university.